Coco opened over Thanksgiving weekend here in the United States and I'll confess: I didn't rush out and see it. That's because Coco had already set an unrealistic expectation in my head. Prior to its U.S. release this latest venture from Pixar became the highest-grossing film in Mexican box office history (and it's also the setting for the film). Matt Zoller Seitz at RogerEbert.com had given it a four-star review calling it a "classic." The buzz on social media was already awarding Coco the Best Animated Feature Film Oscar and at the same time, in the arena of film criticism on Twitter, there was uproar over the lack of Latino and Latina film critics writing about it (resulting in the hashtag #FilmCriticismSoWhite). In short, for me, Coco ballooned into a larger than life movie that it couldn't possibly live up to. Then came the weekend after Thanksgiving and I finally went and saw it. It was a Sunday matinee, with a decent audience size. The film was preceded by an insufferable animated short (Olaf's Frozen Adventure) that was originally intended to be broadcasted on ABC for the holidays. Then, finally, the studio logo appeared and my ears perked up when I noticed the Disney theme music had been given a Latin twist. "Alright Coco," I thought to myself, "Let's see what you got..."
I should stop here and say that I am Latino. My mother is from San Jose, Costa Rica and my late father (he died two and a half years ago at the age of forty-nine) was from Quito, Ecuador. They both emigrated to the United States with their parents roughly around the same time in the 1970s and when they were seniors at a high school in Chicago, Illinois, my mother learned she was pregnant with me. In other words, I fit the mold of what many second-generation Latinos did: being the offspring to young Latino parents. That is to say our teen parents were preoccupied with trying to "become American" and get acclimated to the stateside lifestyle, leaving us -- already natural born U.S. citizens -- to lean and rely heavily on our Latino grandparents (a.k.a. our abuelos and abuelas) to keep us connected to our non-U.S. heritage. So back to the movie. 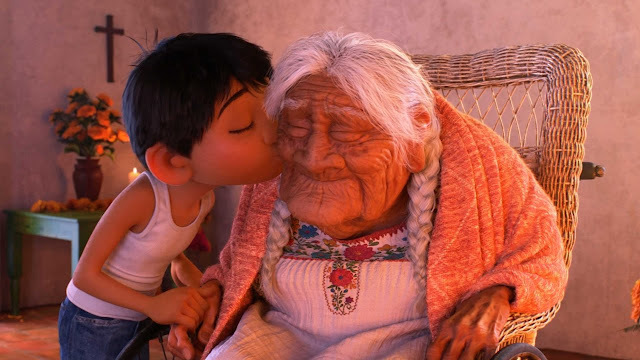 The name of the film actually refers to its great-grandmother character, Coco (Ana Ofelia Murguía). We learn, through our good-spirited and well-meaning twelve-year-old protagonist Miguel (Anthony Gonzalez), that his great-grandmother Coco's parents were once deeply in love. That is until Coco's father -- an aspiring musician with dreams of stardom -- left his family and never returned. Because of this, Coco's mother banned music from their home indefinitely and this absentee father was never to be spoken of again. Generations later, this becomes a problem for Miguel because his passion is for music. He's not allowed to play his guitar or even listen to music. Therefore his soul is incomplete. Without giving too much of the plot away, Miguel eventually finds himself in the amazingly rendered Land of the Dead (don't worry, Miguel himself is not dead), and in the process he makes some startling discoveries about his family's past. Coco's Land of the Dead is the richest and most eye-popping realization of Día de Muertos imagery that I've ever seen on screen. But with stunning images to spare, I couldn't quite put my finger on why I wasn't wowed over by Coco. I suppose it was the hype going into it, but that reasoning seemed trite. As I watched the film, I appreciated the artistry, the music and its heartwarming message. But the oomph factor that Pixar usually dishes out was missing for me. For example, with Toy Story there was the discovery of CGI sustaining the imagination for a feature length's running time. With The Incredibles, Pixar proved it could make a red-blooded, exciting action film for adults too. But what did Coco do for me? After the film finished, I was replaying sections of it in my head while walking through the theatre lobby. By the time I made it outside the theatre, it clicked in my head. Coco hit so close to home with its value system and certain family dynamics that I was zeroing in on the dressings of the film and not the accomplishments it was achieving (especially with non-Latino moviegoers). For example, I zeroed in on the family's disapproval (or overall aloofness) of wanting to become an artist and identified with that frustration. In addition, my parents split when I was eight years old, so I understood what it was like to live without my having my father around. (As a result, my father wasn't very well regarded by many relatives.) But most importantly, Coco speaks to what many Latinos can relate to: the constant aura of death, particularly in the form of their abuelos and abuelas. Coco did such a miraculous job of hitting those touchstones, that I took it for granted. No wonder I was fidgeting in my seat grunting about how uninteresting I found Miguel's alley dog to be. 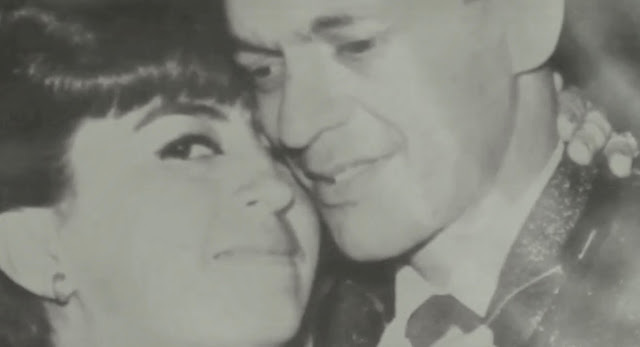 Coco was matter-of-factly telling it -- "it" being Latino -- how it is. It didn't need talking toys or cars to catch my attention. Coincidentally, the same day I watched Coco was also my maternal grandmother's 79th birthday dinner. I went straight to my grandma's right after the theatre. My grandma (a.k.a Mama) Digna is someone who takes death very seriously and regards it in dramatic fashion. "Your grandmother has been saying she's dying since you were only a few months old," my mom always quips. Mama Digna has what we refer to as an "altar" in her living room. Religious iconography is everywhere in her apartment. She prays to a different saint for each day of the year. Because of a previous surgical injury in the 1990s she's mostly wheelchair bound, only sustaining the ability to stand and walk in short spurts (mostly for bathroom use). She has a stockpile of Holy Trinity candles on her bedroom dresser. And every year, before she blows out her birthday candles, she reminds us all that it's her last birthday. My grandmother Digna is the strongest tie I have to my Latino heritage. She sings the national anthem of Costa Rica on occasion and credits whatever brains my siblings and I have to her late husband (my late grandfather) who died at a young age to stomach cancer. My grandfather Eidilio was a teacher and he also played in an orchestral music group in Costa Rica. He passed away two days before my mother turned seven years old. The best photo of my grandparents hangs in Mama Digna's living room. In the photo my grandfather just finished playing a set and he's slow dancing with Mama Digna, holding her close to his face. They're in love. You can feel their warmth just by looking at the photo. I've never met my grandfather Eidilio but he comes to life a little bit every time I look at that photo. Coco celebrates Día de Muertos gloriously and even though it's a Mexican holiday, the ideas behind honoring the dead through photos and prayer is something that is practiced through all of Latin America. (The Christian version is All Saints' Day.) The film's Latino co-writer and co-director Adrian Molina is the same age as me and I'm sure a lot of his own life experiences are peppered into the script. Molina understands that even though Coco's location and traditions are largely Mexican, its inherent seriousness about mortality and familial honor is the backbone for the Latino experience. Coco has obviously struck a chord in the United States. As I write this piece, it just topped the box office for the second weekend in a row. That is saying something very powerful in a time where U.S. President Donald Trump promotes and encourages hate on a daily basis. As I think about my not-so-successful first viewing of Coco, I look forward to seeing it again. I also hope to one day show the DVD (in Spanish, of course) to my Mama Digna. I'm sure she would revel in it. And I'm also sure the film's climatic Oscar-bound song "Remember Me" will resonate even deeper for me. In the end, whether you're Latino or not, no te olvides de tu abuela.